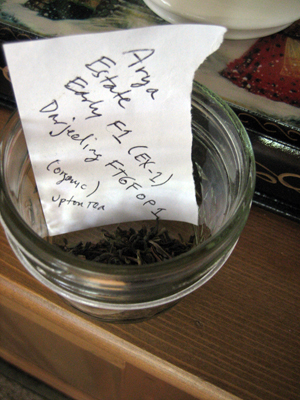 The full name of this tea is actually “Arya Estate Early F1 (EX-1) Darjeeling FTGFOP1 (Organic)” imported by Upton Tea. I don’t know whether I should either curtsy or wait for the judge to award “Best in Breed”. 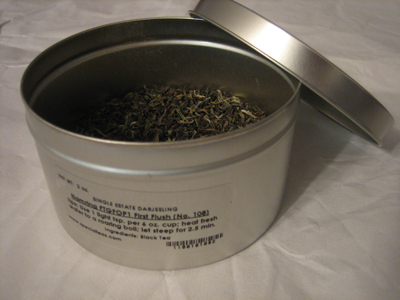 A sample of this lovely tea was a gift from a friend I met through my spinning wheel group. 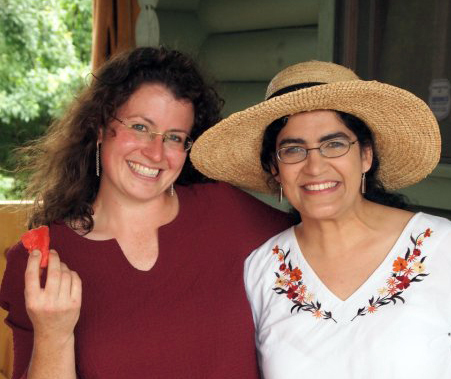 We’d talk tea, science fiction, wool fibers, writing, acting, farming, podcasting and anything else you can think of. She and her herd of goats, many artisanal cheeses and entirely too much raw wool recently moved to Arizona to be with her new husband, a rancher and farmer. I treated this tea like a typical darjeeling, bringing my water to a full rolling boil, then steeping it for about three and a half minutes. The brewed tea was a beautiful golden color with a wonderfully mild and smooth, slightly sweet (even without any sweetener) taste. There was nothing too over powering and no aftertaste to speak of. The taste might be a little too mild for some darjeeling lovers but I found this tea went well with everything I had for my afternoon lunch, including a spicy deli meat, crispy raw vegetables and sweet bing cherries and artisanal goat cheese. Not bad, and definitely a tea to recommend. 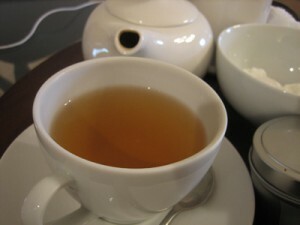 Not feeling terribly adventurous today, I pulled out another Darjeeling that I bought from SpecialTeas. (Yes, yes – I have a LOT of teas from this particular online store.) This time it was No. 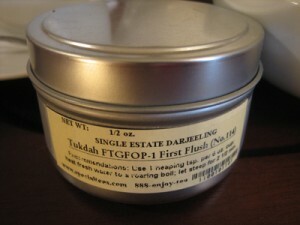 118, aka “Tukdah FTGFOP-1 First Flush”, a nice dependable tea that I’ve tried many times before. Very tippy dry leaf with a wonderful aroma! This top grade first flush is lighter in cup color than our 105 Puttabong, but very complex with a peach blossom fragrance that carries through and lingers on the palate. 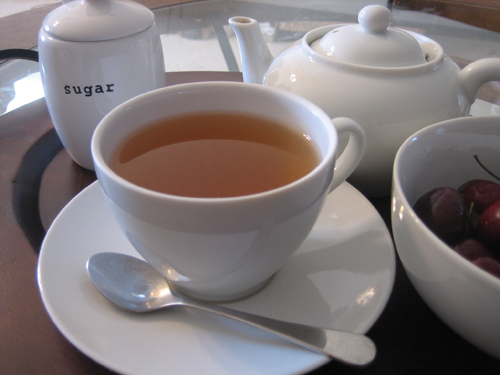 Enjoy this tea when you have time to savor each and every sip. 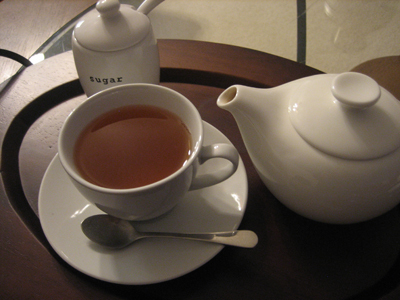 I used the recommended amount, putting 2 level teaspoons into my tiny teapot. I wasn’t paying attention to my electric kettle however, and let it come to a roaring boil. Not particularly picky today, I decided to just go with it rather than following the recommendation to use steaming briskly (195ºF). I let the tea steep for two-and-a-half minutes. And as I suspected, this tea did not disappoint. It’s a light-to-medium bodied, smooth and fruity tasting tea. I’d agree with the description on this one, as it reminds me just slightly of Republic of Tea’s Ginger Peach. I’d go so far as to describe this tea as “cuddly”. It was just the thing I needed to get started on a grey morning such as this one. This is a highly recommended, dependable tea. Slightly darker in cup color than both our No.105 Puttabong and No.114 Tukdah, this Namring first flush is deliciously complex. Primarily floral in both liquor and aroma, one can also discern a soft fruity-nutty undertone. A wonderful even plucking of bright green and dark brown leaves with some silvery tips. The taste however, was completely different. 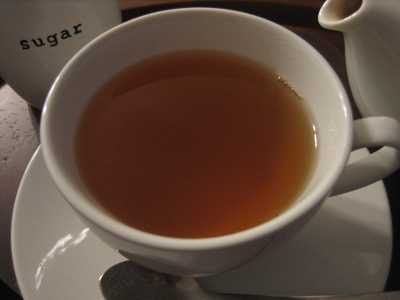 Again, the taste was definitely a Darjeeling, and still had a medium-bodied feel. 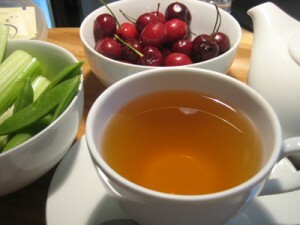 However, my first steeping was definitely a nutty, almost oaky taste, with just a touch of bitter tannins. The second steeping proved to be much better. In fact, it was quite lovely, and considerably more fruity.The third steeping (at almost 4 minutes) was almost still as dark and full of the flavor of the second steeping. I may try this again, but opt for a slighltly shorter steeping time at first, and gradually increasing until it loses its flavor. 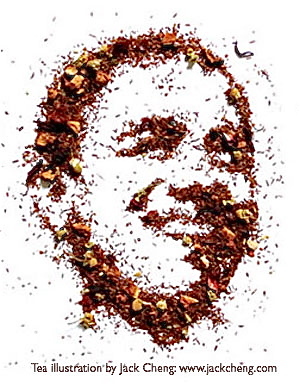 Obama Tea Art in rooiboss thistle and dried fruits by Jack Cheng. 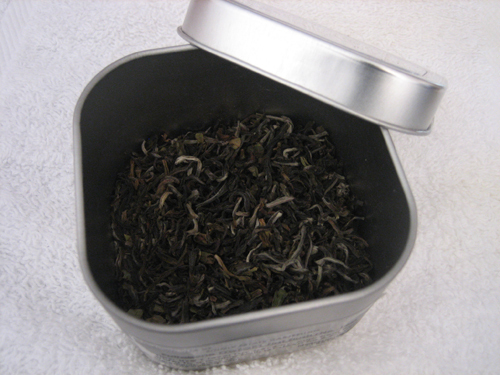 The taste was definitely a Darjeeling, musky and floral with an incredibly smooth and medium-bodied feel. Though I brewed for a full three minutes, there was absolutely no hint of bitter tannins at all. 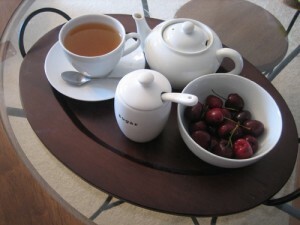 It’s too bad this tea is no longer listed, because it was absolutely lovely and I’m going to run out of it quickly. After a quick search I found that Holy Mountain Trading Company and Dragonwater Tea Company both list this tea. I was right, it’s pretty expensive, but I think I can agree with the one site that listed this as the “champagne of teas”. I haven’t tried a second steeping yet, but given the price, I will! All in all, a lovely way to start the day. Postscript: I did try a second and a third steeping. The second was as lovely as the first. Still fairly full-bodied and smooth, and the taste still came through. The third steeping was a noticably paler color and it had lost much of its body and flavor, though there were still no bitter tannins to be had.